"Their only crime is practice of their faith," says Baha'i representative to U.N.
(CNN) -- Six Baha'i leaders in Iran were seized and imprisoned this week, the religious group said. The act prompted condemnation and concern from the movement and a top American religious freedom panel. A U.S. panel says attacks on Iran's Baha'is have increased since Mahmoud Ahmadinejad became president. Iranian intelligence agents searched the homes of the six on Wednesday and then whisked them away, according to the Baha'i's World News Service. The report said the six are in Evin prison and that the arrests follow the detention in March of another Baha'i leader. The Iranian Foreign Ministry could not immediately be reached for comment, and the incident has not been mentioned in Iran's state-run media. "Their only crime is their practice of the Baha'i faith," said Bani Dugal, the principal representative of the Baha'i international community to the United Nations. The U.S. State Department issued a statement Friday "strongly" condeming the arrests, which it said were "a clear violation of the Iranian regime's international commitments and obligations to respect international religious freedom norms. "We urge the authorities to release all Baha'is currently in detention and cease their ongoing harassment of the Iranian Baha'i community," the U.S. statement said. The group -- regarded as the largest non-Muslim religious minority in Iran -- says the arrests are reminiscent of roundups and killings of Baha'is that took place in Iran two decades ago. "Especially disturbing is how this latest sweep recalls the wholesale arrest or abduction of the members of two national Iranian Baha'i governing councils in the early 1980s -- which led to the disappearance or execution of 17 individuals," Dugal said. "The early morning raids on the homes of these prominent Baha'is were well-coordinated, and it is clear they represent a high-level effort to strike again at the Baha'is and to intimidate the Iranian Baha'i community at large," she added. The United States Commission on International Religious Freedom -- a government panel that advises the president and Congress -- condemned the Wednesday arrests, as well as another in March. The commission chairman called the acts the "latest sign of the rapidly deteriorating status of religious freedom and other human rights in Iran." The commission said the seven were members of an informal Baha'i group that tended to the needs of the community after the Iranian government banned all formal Baha'i activity in 1983. The commission chairman, Michael Cromartie, echoed the fears that the "development signals a return to the darkest days of repression in Iran in the 1980s when Baha'is were routinely arrested, imprisoned, and executed." The Baha'is are regarded as "apostates" in Iran and have been persecuted there for years. "Since 1979, Iranian authorities have killed more than 200 Baha'i leaders, thousands have been arrested and imprisoned, and more than 10,000 have been dismissed from government and university jobs," the commission said. The commission said that since President Mahmoud Ahmadinejad came to power a few years ago, Baha'is "have been harassed, physically attacked, arrested, and imprisoned." "During the past year, young Baha'i schoolchildren in primary and secondary schools increasingly have been attacked, vilified, pressured to convert to Islam, and in some cases, expelled on account of their religion." The commission said other groups in the predominantly Shiite Muslim country of Iran, such Sufis and Christians, are subject to intimidation and harassment. 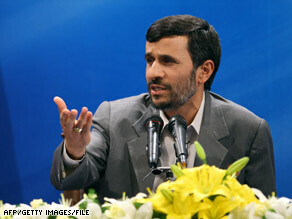 Ahmadinejad's inflammatory statements about Israel have "created a climate of fear" among the country's Jews. The Baha'is say they have 5 million members across the globe, and about 300,000 in Iran. The Baha'is say their faith "is the youngest of the world's independent religions" and that its basic theme is that "humanity is one single race and that the day has come for its unification in one global society." They say their founder, Baha'u'llah (1817-1892), is regarded by Baha'is as "the most recent in the line of Messengers of God that stretches back beyond recorded time and that includes Abraham, Moses, Buddha, Krishna, Zoroaster, Christ and Muhammad."